Bin Laden's Death Prompts 'Fist-Pumping Joy' For One Ticket Agent : The Two-Way Michael Touhey was working at the Portland International Jetport on Sept. 11, 2001, and checked in two of the terrorists who later that day would fly a jet into a tower at New York's World Trade Center. 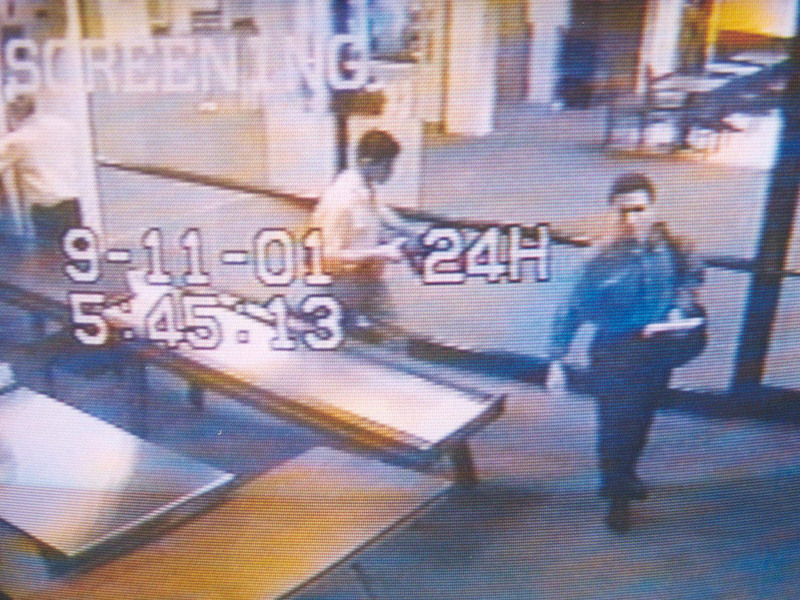 Sept. 11, 2001: A surveillance camera image of two men identified by authorities as Mohammed Atta (R) and Abdulaziz Alomari (C) at the Portland International Jetport. That was the reaction of Michael Touhey to the news that al-Qaida leader Osama bin Laden was killed by U.S. forces. As Maine Public Radio's Josie Huang reports, Touhey "is the US Airways ticket agent who checked in Mohammed Atta and Abdulaziz Alomari at the Portland International Jetport, en route to Boston" on Sept. 11, 2001. They were among the terrorists who that day commandeered jets and killed nearly 3,000 people in the worst terrorist attack ever on U.S. soil. Touhey, Josie reports, "has been haunted by the experience ever since." "I felt a certain joy — which you're not supposed to feel, you know, at someone's death," Touhey says. [But] "when it happened to Hitler, I'm sure a lot of people felt that way too."